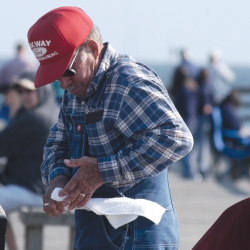 It’s no secret what draws people from all over to the Crystal Coast each year. In an area blessed with miles of beautiful shoreline, thousands of people park themselves on the sand to work on their tan, whether it’s for a lazy afternoon or for the entire summer. And they keep coming back in greater numbers every year. In Carteret County alone, the 60,000 people who call themselves locals are outnumbered more than 2 to 1 when summer rolls around. The local economic development corporation has figured that the seasonal population is nearly 150,000, with projections on the rise. These tourists are the lifeblood of the local economy, pumping millions of dollars into the Crystal Coast. But one bad hurricane season can put a damper on the party, and not every mom-and-pop establishment that gives the beach some of its charm is prepared to weather the storm. With that in mind, local leaders and business people have been working to boost the appeal of the Crystal Coast to year-round visitors, hoping to make the region known for more than just its beaches. More people have been coming to the area year-round, there’s no doubt about it. Just look at the ever-increasing hotel occupancy tax revenues. With thousands upon thousands of new visitors bringing thousands and thousands of more dollars rolling into regional coffers every year, the area’s tourism leaders are trying to spend some of that to get the word out about the Crystal Coast to an even wider audience. From new multi-million dollar attractions to the natural beauty of the shore, the lure of the area is becoming known. And sometimes, those new tourists decide to extend their vacations permanently. It doesn’t hurt that the Clingman clan loves to fish. They certainly came to the right place. Thanks to the warm waters brought in by the nearby Gulf Stream, the fall and winter months bring teeming schools of fish, from tuna to striped bass, making the North Carolina coast a hit with fishermen since the place was first settled. But constant development at the beach hasn’t always been best for the fishermen. While deep-sea fishing is still plentiful for those with a boat, reeling them in a little closer to shore has become more difficult as, one by one, the area’s landmark fishing piers are disappearing as developers snap up land for prices current owners just can’t resist. Condos seem to be more profitable than a lazy day fishing on the pier. Still, there are plenty of opportunities for people to fish, and affordable tours leave for open waters year-round. Carteret County Tourism Director Carol Lohr says she expects the aquarium to be a big hit year-round, but there’s a lot more to do on the Crystal Coast. Of course, nature both in and outside of a fish tank draws thousands to the area — spring, summer, fall and winter. Not only does the aquarium itself offer an extensive nature trail giving visitors an inside look into a maritime ecosystem, but unique birds and species of plants and animals of all types can be found anywhere just off the beaten path on the Crystal Coast. But Lohr and her colleagues don’t want to let nature do all the work in attracting new blood and new dollars to the region. Local leaders, business people and tourism officials have been working to bring new attractions and festivals of every variety to spice up off-season tourism. 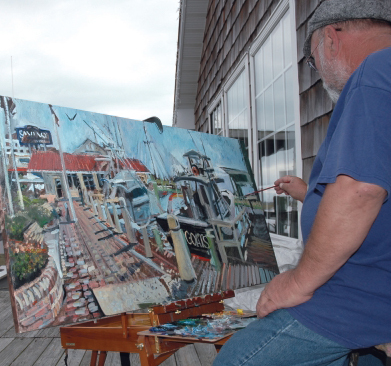 From music and seafood festivals to new off-season events like the Tall Ships Festival and the annual Newport Pig Cookin’ contest, the Crystal Coast is growing to attract visitors with a wide variety of interests — especially history buffs. Fort Macon continues to draw thousands of visitors year-round to look at a brick and mortar piece of American history. Recently restored to show sections of the 170-year-old fort as they looked during the Civil War and World War II, when the Navy used the site to look for German U-Boats, the fort and its nearby undeveloped beaches continue to be a big hit with tourists. The fort boasts several living history programs year-round, from period weapon demonstrations to re-enactments. Aside from Fort Macon, Beaufort boasts museums and a look into the area’s hundreds of years of maritime history. On the first weekend of every October, thousands flock to Morehead City’s waterfront for the North Carolina Seafood Festival, which has grown into the area’s most popular off-season tourist draw. Visitors from all over enjoy the rides, games, entertainment — and, of course, seafood — the event has served up in abundance since the mid-1980s, all the while boosting the economy and introducing themselves to the Crystal Coast’s natural splendor. 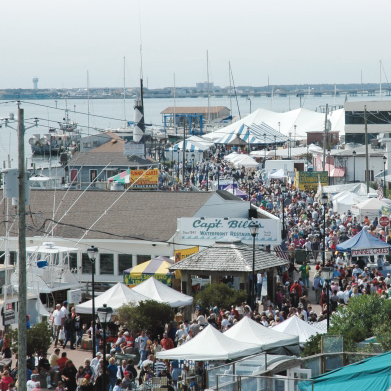 In 2006 the Seafood Festival celebrated its 20th anniversary with no signs of slowing. While the list of events and locations that attract people to this little corner of the state could go on, one thing is certain: The Crystal Coast is no longer the sleepy little collection of beach towns people used to visit to get away from it all. Now, it seems, it’s all here — and it’s here all year.